Let us come with branches to praise Christ the Master in faith like babes, purifying our souls, and crying to Him with a loud voice: Blessed art Thou, O Savior, Thou Who didst come into the world, and did become a new, spiritual Adam from the first curse, and didst prepare all things for the best, O Thou Word, Lover of mankind, glory to Thee. 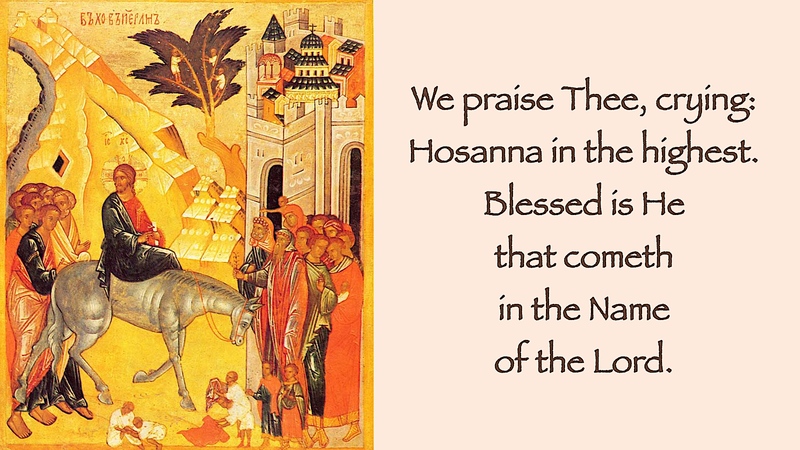 their hands and crying to Thee: Hosanna! Blessed art Thou Who didst come to save the world. Give praise with one accord, O peoples and nations, for the King of the angels rides now upon a foal, and He comes to smite His enemies with the Cross in His almighty power. Therefore, the children sing to Him with palms in their hands: Glory to Thee Who hast come as Conqueror! Glory to Thee, O Christ the Savior! Glory to Thee, our God, for Thou alone art blessed!